February 14 ... usually people either love it or hate it! If you don't have a sweetheart or you're suffering from a broken heart, you can always show love to your family and friends. There are lots of idioms and expressions about love and relationships. 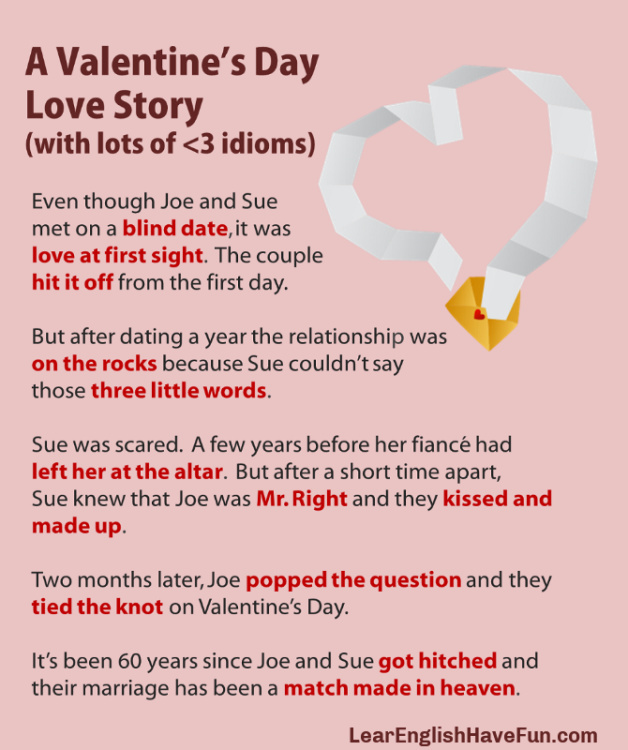 The story (in the picture above) has several love idioms. Do you know any of these? If you don't understand all of them, the definitions are below. blind date: a date (social meeting) where two people have never met before. We have a party each year called "screw your roommate" where we set-up our roommates on a blind date. love at first sight: feeling an immediate attraction or love for someone when you first see or meet them. It certainly wasn't love at first sight because my girlfriend was too drunk to even see straight when we first met. hit it off: to immediately become friends with someone. I really hit it off with a girl I met on the train. We've been texting and speaking every day on Skype and I'm going to travel back to Boston to see her next month. on the rocks: the relationship is having problems. My parents' marriage has been on the rocks since my father started spending a lot of time working late with a woman in his office. three little words: these words are “I love you”. I keep waiting for my boyfriend to say those three little words but I'm wondering if he's capable of doing it. leave someone at the altar: to leave someone just before the marriage should happen (couples who get married in a church stand in front of a structure called the altar). I want to kill my friend's ex-fiance for leaving her at the alter. He could've canceled the wedding a lot earlier! Mr. Right: the man who is the right (or perfect / best) person to marry. I wish I had waited for Mr. Right instead of getting married and divorced three times. kiss and make up: to apologize/forgive someone and be a couple (or friends) again. The best part of having a horrible fight is when you finally kiss and make up. pop the question: to propose (ask) marriage to someone. I thought my boyfriend was going to pop the question but he broke up with me instead. Many people want to tie the knot on Valentine's Day so they can remember the date of their anniversary. It's crazy but my grandparents were only 16 years old when I got hitched. match made in heaven: a perfect couple (or combination of things). Even though your parents had an arranged marriage they are absolutely a match made in heaven. Practice makes progress. 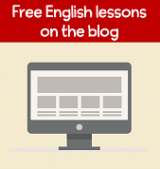 It's your turn to use any of these idioms in your own sample sentences. I will provide feedback to make sure you use the idioms correctly.